Dave Rapoza: Just finished up another LiveStream! Just finished up another LiveStream! Just a real quick dump here! Finished my LiveStream :D! Good 3 hours, had a lot of fun! I'm hoping to do these every monday so keep an eye out. 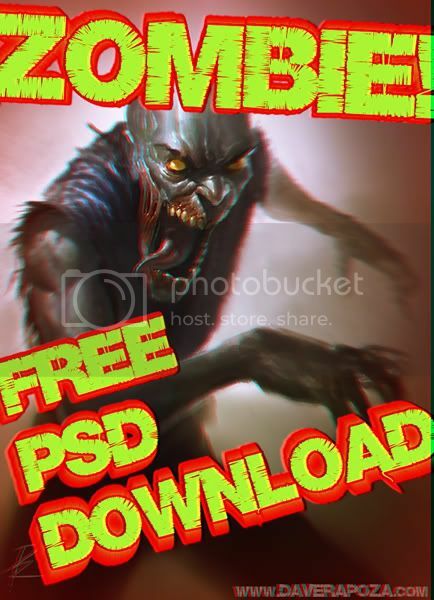 Anyways, as promised, heres the download to the psd of the Zombie I did tonight! All seperated layers! Click here for the PSD Download!!!!!! Big thanks to Johnny Fowle(jfowle) for the host! nice of you to post your asset from the evening. If you needed a suggestion, i do believe that Deviantart allows you to upload a .psd file, or even a .zip file. I've done it before for line-arts and such. That'd probably be the most easily accessible to a lot of people. Great idea, dave! Awesome work as always... Congratulations, dude! Glad you like it :D, thanks! Are you going to do speed-paints or something similar with your livestreamed pieces? Due to bandwidth limits, i can't watch livestreams during the day :( and I'd absolutely love to watch. I've learned so much from your speed paints and other tutorials. Thanks so much for sharing! i enjoyed the live stream. keep up the good work. ooohhh, already got you with the livestream re-watch action :D! Really happy to help!